We've discovered new ways to explore the region we love. The rainforest trees are beginning to sway in the night sky and a storm is on the way. There’s an electrical charge in the air and then the storm breaks. Torrential rain pummels the trees, lit up by silver light as thunder booms above. Then, as quickly as it arrives, the storm passes and the night creatures come out. Fireflies float through the forest like tiny fairies and ghostly mushrooms glow in the dark. It’s a magical experience, being in a rainforest at night. But I’m not actually in the forest. I’m sitting in a dark room in the Rainforest Discovery Centre at Mary Cairncross Scenic Reserve in Maleny. The Dusk to Dawn room plays this scene on rotation and it captivates children and adults alike. The reserve isn’t open at night, but this experience embraces technology to deliver the next best thing. It’s just one of the highlights of the new Rainforest Discovery Centre, which opened early last year after a $4.7 million upgrade to the visitor facilities at Mary Cairncross Scenic Reserve. This included a new $330,000 interpretive centre that makes excellent use of technology and multimedia to enhance visitor experience. A set of iPads can be held up to a wall painted with murals and rainforest photos pop up on the screen through the use of augmented reality, a novelty that brings a cool factor to nature education, especially for kids. Magnifying walls, microscopes and soundscapes all help visitors interpret and connect with the flora and fauna of the stunning scenic walk through the lush subtropical rainforest. Michael Gilles is a senior environmental visitor centre officer with the Sunshine Coast Council and was integral in leading the Mary Cairncross upgrade. “One of our key drivers was to provide an experience that people could be part of no matter what the weather,” he says. “Someone can come and have quite a good time even though they might not be able to access the track if it’s wet. “We were fully aware of the generational shift that has taken place. In our childhood we were engulfed in nature every spare second. We were outside, exploring creeks and rivers. In the last generation, there’s been a total shift. The opportunities to experience nature are quite limited and children are involved in tech in the home, so we wanted to look at the use of tech to draw them into the wonders and magnificence of the natural environment. And it’s not just kids who find the technology at Mary Cairncross engaging. It appeals to all age groups and you only need to take a look at some of the reviews on TripAdvisor to see how successful the new Discovery Centre has been with visitors, with 96 per cent of reviewers rating it either excellent or very good. The woman behind the company charged with creating the interpretive centre, Kelley Noonan of Focus Productions in Brisbane, says we are limited only by our imagination (and budget) when it comes to using technology to enhance people’s understanding and connection with a place. “We started initially working alongside the architects during the community consultation phase,” she says. “We consulted with community groups, the council, bird people, frog people, fungi people… Pulling out those stories and asking, what do we want people to experience? Who are our audience and how do we want to engage them? How do they learn? Kelley has been running her business for 14 years, travelling the country installing innovative exhibitions and displays in visitor centres and museums. She says in the future, more tourist destinations will be incorporating technology and multimedia in ingenious ways. We already have projection mapping – think the Vivid lights on the Sydney Opera House – and beacon technology, which can send interpretative information to the user’s phone when they pass a tourist attraction. “With virtual reality we could put somebody up in the canopy at Mary Cairncross, where you could have them do a flight. You could put them in an alternative reality, change their scale so they can experience it from the size of an insect or the height of a bird. Whether it’s pushing a button and hearing a bird call, holding up an iPad to a picture on the wall or experiencing an historical event through virtual reality, the one thing all these experiences have is a reliance on story. “People love stories, they relate to them, they remember them,” says Kelley. It’s not just the Sunshine Coast Council that’s harnessing the power of technology to enhance visitor experience of our region. Various commercial operators are jumping on board the technology wave too. At Sea Life Sunshine Coast, visitors can have an interactive Finding Dory experience where they ride the East Australian Current and use their own echo locator in Nemo’s Anemone Challenge. But it’s not just the big guns getting involved. Small operators are spotting opportunities too. Brett Potter of Doonan launched Eco River Rides in September. He operates solar-powered canoes that allow visitors to cruise a waterway in silence, with no paddling and no noisy motors to disturb the symphony of birdsong. “It had always been a plan for me to do a tourism business with electric and/or solar-powered canoes,” he says. “The technology of the motors has improved only recently. These new motors, called ePropulsion motors, are really efficient and go five times further than the cheaper motors. You don’t have to heap a pile of batteries in. It’s a four- or five-kilo battery that you attach to the motor itself and it can get up to 50 kilometres in one charge. 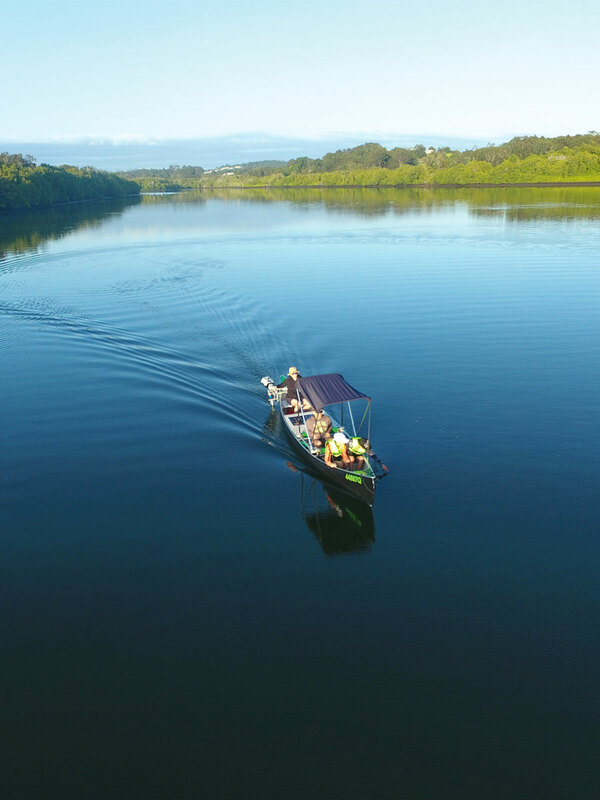 As part of the trip, passengers stop off at the Maroochy Wetlands Sanctuary jetty and follow a 900-metre boardwalk to the interpretive centre, which was also created by Focus Productions for the Sunshine Coast Council. The walk traverses wet and dry eucalypt forests, rainforest, melaleuca forest, casuarina woodland, salt marsh and mangroves, featuring abundant birdlife, crabs, butterflies and other creatures. The best time to visit is winter, as mosquitoes are out in full force in summer. The interpretive centre is smaller and more low-tech than the Mary Cairncross Discovery Centre, but still makes great use of technology to enhance the wetlands experience for visitors. It recently received a new $5500 microscope camera, which allows visitors to see insects and other creatures projected onto a screen, rather than looking down the barrel of a microscope. It’s the pièce de résistance of the centre, which also includes an audio storyboard that tells the stories of the people involved in the wetlands and an eight-button audio exhibit that allows you to hear the melodic golden whistler, the strange squeak of the brahminy kite or the familiar refrain of the eastern whipbird. Maroochy Wetlands Centre has formed a partnership with the QuestaGame app, which allows you to earn points by submitting photos you find of animals, plants and fungi or identifying the sightings of other players. It’s highly popular with students because it works like an eco-treasure hunt and not only gets them into the outdoors, but really interested in learning about it. Nothing like scoring points and beating classmates for motivation. The Sunshine Coast is just getting started in embracing technology to better understand where we live and what came before us. Some exciting new projects are currently being discussed, like a virtual reality experience of the SS Dicky, which will allow visitors to see what the ship looked like and how it came to meet its rusty end on Dicky Beach. There’s a real sense we are on the brink of something awe-inspiring and as a new wave of technology washes across the Sunshine Coast, we’ll see the magic that can happen when the human mind is harnessed in a way that protects, preserves and enhances our understanding of our natural environment by fostering something very important: a heart connection.